Meet Bharat and read his story…. Bharat is a 29 year-old man from Rolpa in the far west of Nepal. He is married with a 2 year-old daughter and used to work for a government school as a part time teacher. A year ago, he decided to leave his job and go and work as a laborer in Dubai. After twelve months he returned to Nepal to see his family, but was injured in an accident and sustained facial fractures and a badly broken leg. He was taken to a hospital which was a 3 hour walk away from his village, but they were unable to treat him. He was told to go to Chitwan eight hours away. He was operated on there to fix a fractured facial bone and had an external fixator applied to his badly broken leg. 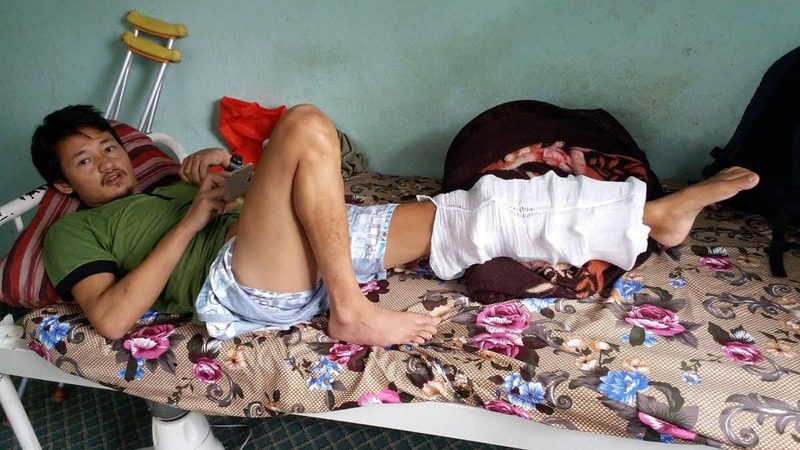 He was in hospital for two months before being discharged home, but he still required daily dressings which is a disaster for people who live in remote regions with no access to health care. Dressing products were costing him about $2 a day. Many people find it hard to believe that medical costs in a third world country can be so crippling. Bharat’s initial hospital stay cost about NPR 5 Lakh which is about AU$7,050. He was able to fund a fifth of this medical bill with his savings from his time in Dubai and he took a loan for the remainder from friends and family as is common in Nepal. After 5 months he was required to go to Chitwan for a follow up and the doctors found his wounds were infected and he required further surgery. He was hospitalized for another month. His medical bill for this stay was approximately $4,230. His community chipped in NRP 50,000 – approximately $600 (this kind of support is common in close knit communities in rural Nepal) and in order to pay the remainder, he borrowed more money from relatives. Two months later the hospital said they had to operate again to do a bone graft which cost a further NPR 2 lakh or $2,820. The wounds still did not heal, and the hospital asked for a further NPR60,000 or $ 720 so they could do a skin graft. He had no more money and had exhausted all his borrowing options. Luckily, Bharat had a chance meeting with Karna, an ex-patient of NHEDF’s who was injured in the earthquake and spent two years there. He contacted them and referred Bharat. Without NHEDF this man would have died. His wounds are too graphic to show. We hope you get better soon Bharat! Previous Previous post: We love this video and hope you do too..